When I started this endeavor in 2006, I never expected how my world would change. I had an 18 month old meezer and a not even one year old meezer in the house. I had 2 geezer Orinch Meniss kitties as well. Over the years I lost the 2 geezers and added another Orinch Meniss and another meezer. Life was awesome. We had a lot of fun times on this blog. Hams of the world tour. Haunted houses. Weiner Mobile escapades. Sammy and his Aliens. Dancing Billy. Miles and his constant snark. Christmas poems. The famous (or infamous) Hammy Smells christmas carol. Friends made. Oh so many amazing friends made. Friends lost, and so many tears shed. And then the Orinch Meniss got sick and flew off to the Bridge. My heart was shattered. This past Sept 10 my sweet, amazing Miles flew off to the Bridge. I was in pieces. My sweet Sammy was fighting cancer at the same time. So many friends came to his rescue and helped him. I have no words to thank you for the 15 months you all gave us together. 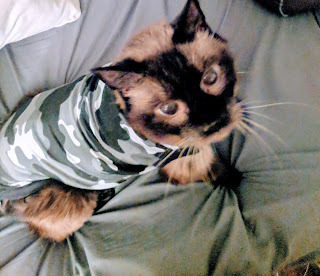 Today, at 5:03am, my sweet Sammy flew off to the Bridge. The sorrow is unbearable for me. I know that we only are borrowing these sweet lives for a short time, but each time I have to say good bye to one of my babies, it gets harder and harder. I don't know if this will be our last blog post - and I know that I have not posted in a very long time. Truthfully, it kind of hurts my heart so much to not share Miles' and Sammy's voices anymore. They were so much a part of me for so long. I still have my sweet amazing Nicky and he has a new geezer Orinch Meniss brother to introduce. I hope to get past this incredible sense of loss to find their voices and carry on. I doubt that after all this time anyone would read this blog anymore, but we will see. Thank you all so much for you love and friendship over the last 13 years. You will never know how much you have enriched my life. Farewell my sweet Sam-Sam. I love you to the moon and back forever. My sweet Miles. You have left the most amazing paw print on my heart that will never, ever go away. I love you my baby boy. Oh...this is so very heartbreaking and I'm so sorry. Sammy was beloved by all in the catblogosphere and will be dearly missed. Love and purrs from Deb and the Zee/Zoey gang. I am, more than these mere words can convey so deeply sorry. Sammy, as I know you know was very special to all of us -- especially to his darling Angel Abby. Now all I can think is that they are reunited again in full health with so many (too many) who have gone before. They are having all those fun times again like we all use to do so many years ago when we first started. I understand fully your Grief, as I still struggle with my own and the brevity of it all. No way would I change a thing, but only to have more time with them. We loved Sammy but we believe in being reunited with our beloveds again. I know all of your sweet kitties are waiting for you and for them it will seem a brief wait while to us it will seem endless. Go easy on yourself -- and give yourself all the space your heart needs. I am so very sorry Mary. I'm so sorry to read of your precious Sammy's passing and understand, Madi made her trip in September. They are the voices we come to love thru the blogs. I hope in time your sorrow is replaced with sweet memories of the love you shared with Sammy. You have been our friends for longer than we can remember, and we loved each and every one of all those adventures. Sadly, with the joy and the adventures also comes the loss, so incredibly heart-breaking, and seemingly so regular. Our hearts are with you on saying all those goodbyes. We feel the same about our own. But please, please never think that nobody would read your blog anymore. We want to know about your new orinch meniss very badly, and we want to know what flavour pants Nicky is wearing these days. Don't leave us without the joy of sharing your joys, even after we have shared your pain. We have wonderful memories of those fabulous events. We are so sad that you have had such heartache. We are happy that you got some extra time with Sammy. Every day is precious. We know how difficult it is to lose a loved one. We really hope you blog again. We want to get to know the new Orinch Meniss and keep up with Nicky and with you. We love you all. We are so sorry to hear about Sammy. We remember meeting you all on the blogger--look other meezers! And we were so thrilled. And we loved those boys. Such voices, such personality. Mama was thrilled to meet them in person even though Miles grumped at her and Sammy hid (and it seemed to appropriate you know?) and Billy thought she was cool... And we can't believe how many have gone. We are sad for your loss(es) also. We still quote the ham statement (Ham? How could you Not have ham?) from your blog from MANY years ago.... We hope you continue to blog. You are a great cat-mom. I subscribed, so get the emails when the blog is updated and see you on Facebook also. Maybe more blogging will help your heart? So much loss, so much sadness, but oh so much love! We are a close knit group back then, we the original bloggers...for most of whom our cats have gone to the bridge now. The passing of each one is a personal loss to me. But the memories!!! The fun, the parties, the adventures. We sustained each other then through good times and bad times, and continue to sustain each other with each loss of a beloved. Mary,today may you feel the collective arms of the Cat Blogosphere embracing you tenderly and sending you our love. Mary, you have spoken beautifully not only of Sammy, but of all your dear kitties ... all who have filled your heart with love and joy for so many years. of those new in your heart ... until then you will be blessed by the memories, the moments and the thoughts of those who came before. We are so very, very sorry to hear about dear Sammy and we send you our best purrs, hugs and all of our love. We understand the sorrow and pain. I'm so sorry about your loss of Sammy Meezer. The Catblogosphere did a very nice tribute. How well I understand. I am so sorry for your loss. My two left in January and I'm still picking up the pieces. I can only offer you heartfelt condolences. Oh this breaks my heart so much. We are just so sorry to hear this news. And we understand how hard it is to carry on with the blog some days. We're still struggling missing Jasper and Josie (as you can see the signature is still Jasper). You are in our thoughts and purrs. We are so sorry for your loss. We are sending lots of hugs and purrs. Mary, I was so sorry to hear about Sammy. He has been a part of the Cat Blogosphere for as long as I can remember. I always loved reading your stories and hearing them from the cats voices. Take all the time you need to grieve the loss of your fur children. I hope to see you blogging again when you feel comfortable sharing the wonderful stories of your cats with us. My thoughts are with you. We send our love and hugs. It hurts to lose old friends. Wish I could offer more than "I'm sorry." I'm bawling like a baby. Sammy and Miles were some of our first friends on the interwebs, and I can't look at ham without thinking of Sammy. Sending you purrs and a big hug. Skeezy and Mao are very happy he's finally joined them at The Bridge. 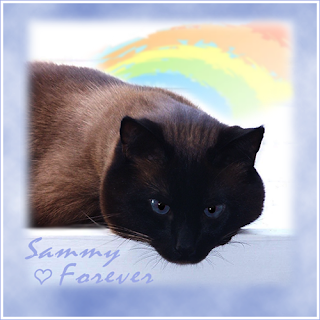 We are so sorry to read that Sammy Meezer has crossed The Bridge. We have missed your blog and hope that, after some time, you will feel up to sharing your new Ornj Meniss and your other furkids. Sammy will still be with you in so many ways - as are the others who have Gone Before. Purrs. We're so sorry to hear this - sending luv and purrs. It's a pain that no one understands, nor can describe. My condolences on your loss; hugs and purrs to you. It so hard to lose not only a treasured kitty, but a treasured voice that has resonated with so many. Of course you are torn, and we are heartbroken along with you. Lots of purrs to you. We'll miss Sammy so much too. I am so sorry for your loss. You were one of our first visitors when we started blogging a few months after you. I am in tears for you and your boys. You are right, we give them their voice. They have their own personalities and we build on that. Some things stay in your mind forever. I can't remember now if it was Miles or Sammy, but one of them had to wear the cone of shame. There was a photo with the caption, "I'm a freaking headlamp!" It struck me funny and I laughed for ages about it. I hope you can remember the fun times and draw on them to help you through your heartbreak, I send you love and virtual hugs. Oh, how we remember the heyday with now-angels Sammy, Miles & Billy. Those days were such fun. So many adventures and Dr. Buddy even operated on Billy's brain at one time. Buddy and all of my original crew except Percy are gone now too, so I know the heartbreak of your losses and also the struggle to pick up and try again. I cry for you. I'm glad Nicky is there to comfort you, along with a new geezer orange menace. Still, I know Miles and Sammy left big holes in your heart. Warm hugs! Like many others, we remember the grand old days of trips,car racing ,snark and lots of humour! Of our original 6 only 2 are left and 1 newish ons(Julie). The pain of losing our dear kitties is hard and we feel your loss. We hope that in time you will be comforted by the good memories. Allow yourself time to grieve. We send our heartfelt purrs and hugs. We are so sorry Sammy had to leave. It never gets any easier to let go. Mom was just thinking about you, this morning, in fact. She knows how you feel about continuing--we know it's been hard for her without William's voice. Please know we are purring for you. Yoo were one of the last of the Old Guard. Yoo will be missed by efurryone in the blogosphere. Sending you lots of love and purrs. Sammy was a great kitty and a great presence in the Blog World. He was a lucky boy to be in your family, and vice-versa. XOXOXO to you and Nicky and the New Kid. I think you will find Nicky and your new Ornj Boy might have some adventures to share soon, and a new chapter might yet open. And we think you would have *plenty* of visitors! I know how you feel about the loss of a voice for the blog. When Frostin was alive a posted almost daily, then when he passed I thought I would be able to switch to Obsidian, but the connection just wasn't there. Later we got Sable, and I was just starting to feel a connection with him when he ran out the door and we still look for him daily. My condolences on the loss of your outrageous and lovable meezer boys. I look forward to hearing from Nicky and his new little brother. Here come my tears again. The empathy I feel for you with your loss is real. I looked forward to and loved reading your posts and anything you wrote from Sammy and Miles. So I feel their loss so much too. 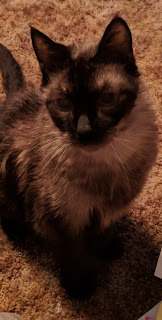 Your meezer voice will be a great loss along with the loss of the boyz. I get it. I have not been able to transition to another voice since my Beau Beau. I'm hoping you will continue. It was so good to read, and so funny. These beautiful creatures become such a part of our lives. I don't know what to say to help you heal, but my thoughts, love and prayers are with you in hopes it can help even just a little to take away the pain. Many blessings to you and looking forward to hearing about Nicky's new little brofur. Oh, its so very hard to hear that Sammy is now also a member of the heavenly realms. Sending huge purrs and lots of hugs. So sorry to hear of your loss. Sending lots of purrs and biscuits your way. Mum has been all leaky eyed the past day. Missing Sammy with you, then smiling at the fun times that Miles, Sammy and Derby had. Love and hugs from me and mum. Please accept my condolences on the loss of your wonderful boys. I haven’t read your blog before, but even so, I hope you will continue. As someone who loves history, and the stories of the people - and cats - that make history, I can tell you that the world may be quieter with viewer voices, but it is poorer. We learn but listening and reading. We learn from other people and cats. We learn from you. So sorry for you loss. Sending purrs and big hugs your way. I’m so sorry for the loss of Sammy. It is a heartbreaking feeling. Sending purrs of comfort and strength. Fly free at the Bridge. Sending hugs and purrs xxxx. We are so sorry for your loss. Sending purrs and hugs. Fly free Sammy, you will be missed.